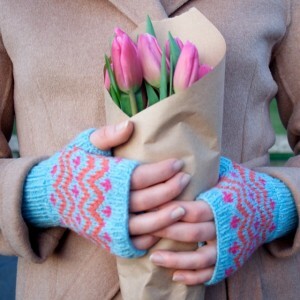 My Muckle Mitts pattern features an “afterthought” thumb, the kind of thumb often employed in folk knitting. 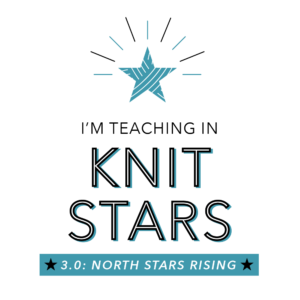 The beauty of it, is you can keep on knitting in your colorwork pattern with hardly any interruption. 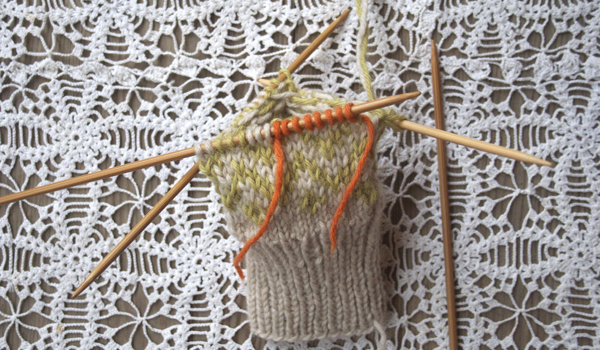 Just work a few stitches on waste yarn, slip them back to the left hand needle and continue on your merry way. 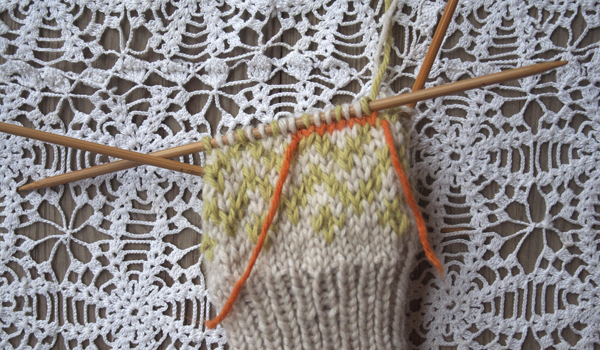 When you’re finished with the mitt, you pick up those stitches above and below the waste yarn and knit the thumb. So lets lake it step by step, by knitting the stitches which will later become the base of the thumb, onto our waste yarn. 1. We knit our mitt through round 11 on the chart. When the round is complete, take your waste yarn and get it into position. 2. Then before we begin round 12, we knit the first 8 stitches onto the waste yarn like so. 3. Ok now just slip those 8 stitches of waste yarn back onto the left hand needle. 4. 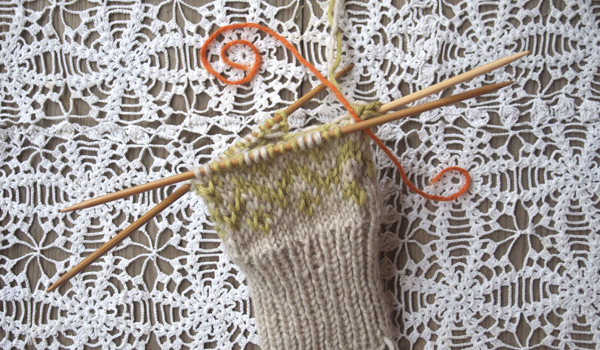 Now you knit round 12 – right into the waste yarn – and continue knitting the rest of the mitt. Easy Peasy Pudding and Pie! 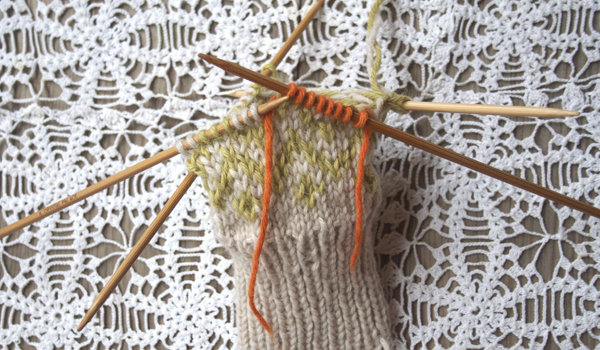 Stay tuned…tomorrow we’ll pick up stitches and knit the thumb. Good idea MJ, I’m all ready for making my mitts but the thought of a new thumb technique was giving me the fear! I know, it’s funny what will create resistance, the scary thought of a new thumb! It could keep me paralyzed for weeks sometimes, while at other times I want that challenge. Thank you, thank you, thank you!!! Downloaded it a while ago but for the life of me I could not understand the how-to of this thumb technique as opposed to traditional gusset – NOW I get it, duh!!! I guess I am a visual learner, after all!!! Sometimes it’s hard to just let go and follow the directions. The need to understand before doing it can overwhelm the need to pick up the needles and just have faith! Oh darn it……I thought the download was til the end of Jan……I guess the phase , you snooze, you lose would come into play here. So glad things are going so well for you….you are so talanted!!!! BTW……if you are ever in need of alpaca fiber let me know…….I have quite a bit and shearing time will be here before we know it.